It’s time to get serious and do some whitetail deer hunting preseason scouting. There are many different scouting tips or techniques that you can use to be more efficient at locating and confirming potential stand or blind locations that will help you increase your odds at getting that buck of a lifetime while minimizing your chances of bumping your buck. I would like to share a few of my favorite whitetail deer hunting preseason scouting tips etc. Velvet buck encountered while scouting. Deer love old field edges and old road beds or logging roads. I like to keep my presence in the woods to a minimum especially the closer it gets to the season. I don’t want that buck to feel any pressure whatsoever. It’s darn near impossible but the less human presence in the woods the better in my opinion. The first thing I do is get a topographical map of the property and get on Google Earth. I look for natural funnel areas. One year in Kansas I scouted a particular piece of property without ever setting foot on it. I located a funnel area between two big lots of timber and I planned my route into the stand location using the wind to my favor and the first time I hunted the funnel I saw a huge buck. I didn’t kill him but I came very close just by scouting on Google earth. This is my favorite way to locate hot spots when I hunt public land for sure. By locating funnel areas online I can save myself a lot of time and walking by checking those spots first once I arrive at the property and already knowing how to get to those spots by looking at the map. Food, water and cover are all things I like to look for, not necessarily in that order. If I can find a spot that has all three in close proximity of each other then I like to locate trails going to and from each one and depending on time of day set up accordingly down wind of these trails. When scouting I look for rubs (fresh or old) and scrapes and deer droppings and trails. If I find several well worn trails that intersect each other I like to set up downwind of those intersections. Also look for beds if you can find where they are bedding you can set up and catch them returning to bed in the morning or leaving the bedding area in the afternoon. If you pat attention to what side of the tree is rubbed on you can tell which direction he is heading. Another way to scout is get as much information from the local farmer or landowner as possible. They can tell you where they see the deer and at what times of day. This can be valuable to determine the best areas to start scouting first. So by following a few of these whitetail deer hunting preseason scouting tips you can minimize the pressure you put on the deer on your hunting land and increase your odds at that big buck this season. Use maps and technology to pinpoint potential stand locations to minimize human activity in the woods especially right before the season. 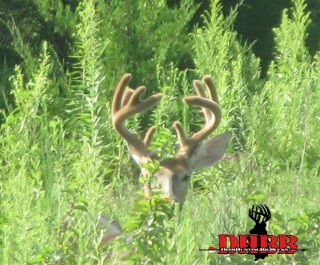 Tagged velvet Kansas buck, whitetail deer hunting preseason scouting. Bookmark the permalink. Thanks for stopping by Hunting Magazine, yes it is.